The Install/Uninstall Patches configuration enables you to install or uninstall patches/service packs from a central location. You can click on Install Patch and select the OS that you wanted to deploy patches/service packs to. Uninstallation of patches is not supported for computers running on Mac operating systems. You can see the steps below to know more about installing and uninstalling patches using Desktop Central. Follow the steps mentioned below to install/uninstall patches and service packs for windows operating systems. Choose the operating system as Windows and then create a configuration that needs to be deployed. Provide a name and description for the Install/uninstall Patches Configuration. Note: Specify the operation type as Install to install the patches/service packs. If you have reached this configuration page from the Patch Management tab by selecting the patches, the selected patches automatically gets added to the List of Patches. Click the Add More Patches button to invoke the Patch Browser. From the patch browser select the patches and service packs that have to be applied. The patch browser has an option to view the missing patches/service packs or all patches/service packs, which can then be filtered based on the application and service pack. Select this option and specify the date and time after which the patches have to be installed. The patches will be installed based on the Install Options selected after the scheduled time. If you have set any Policy as default, then the default policy will be automatically applied to the configuration. You can choose from the policies which are listed under "Apply Deployment Policy". You can see the Policies segregated as My Policies and Created by Others. You can click on View Details to see the policy details and the list of configurations to which the policy is applied. Using the Defining Targets procedure, define the targets for deploying the Install Patches Configuration. 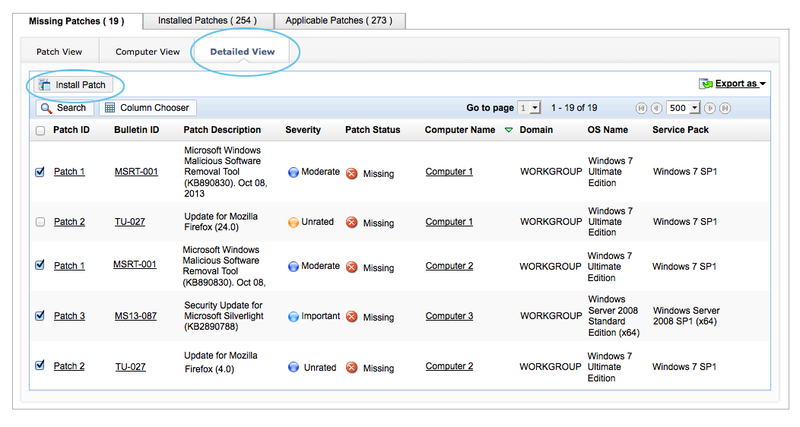 Click the Deploy button to deploy the defined Install Patches Configuration in the defined targets. Deployment will be initiated during the next system startup. Follow the steps mentioned below to install patches Mac operating systems. Choose the operating system as Mac and then create a configuration that needs to be deployed. Provide a name and description for the Install Patches Configuration. Click the Add More Patches button to invoke the Patch Browser. From the patch browser select the patches that have to be applied. The patch browser has an option to view the missing patches or all patches, which can then be filtered based on the application and service pack. Install during computer startup: Select this option if the patches have to be deployed during computer startup. Specify whether the use can skip the deployment at a later time by selecting the "Allow Users to Skip Deployment". When you do not select this option, the deployment will be forced and the user will not have any control on the deployment. When you allow users to skip deployment, you can also specify whether they can skip it as long as they wish or force deployment after a specific date. Do not reboot: Select this option if the client computers should not be rebooted after installing the patches. Force Reboot when the user has logged in: Select this option to force the user to reboot the computer. Specify the time within which the client machines will be rebooted and the message that has to displayed in the client machines. Force Shutdown when the user has logged in: Select this option to force the user to shutdown the computer. Specify the time within which the client machines will be shutdown and the message that has to displayed in the client machines. Allow user to skip Reboot: Select this option to allow users to reboot later. Specify the message that has to displayed in the client machines. Allow user to skip Shutdown:Select this option to allow users to shutdown later. Specify the message that has to displayed in the client machines. If you are trying to create a configuration from Detailed View under All Patches, then the below mentioned scenarios will come into effect. Detailed view will list every missing patch against every single computer in a separate row, which means if a single patch is missing in 5 computers, 5 rows will be listed. when you have chosen to deploy more than one patch for more than one computer as mentioned below, then you might end up in deploying the patches to the computers which you never intended to deploy. Selected Patches: Patch 1, Patch 2 and Patch 3. Defined Target : Computer 1, Computer 2, and Computer 3. As per the above mentioned table, the configuration will be deployed across to all the computers to which the patch is applicable. Patch 2 is applicable for computer 1, but you never intended to deploy it, however the deployment will happen on it, since it is a missing patch. In order to overcome this, it is recommended to deploy multiple patches to single computer or single patch to multiple computers from "Detailed View". If you want to deploy multiple patches for multiple computers, then it is recommended to create multiple configurations or initiate deployment from Missing Patches View. Note: When a Patch Management task is initiated, Desktop Central agent residing on the client computer scans the computer for the missing patches and downloads only the applicable patches from the Desktop Central server. If you are managing computers in a remote office using a Distribution Server, then WAN agents will download the applicable patches from the Distribution Server. However the deployed patches will be replicated to the Distribution Server irrespective of whether the patch is applicable for the remote office computers or not.